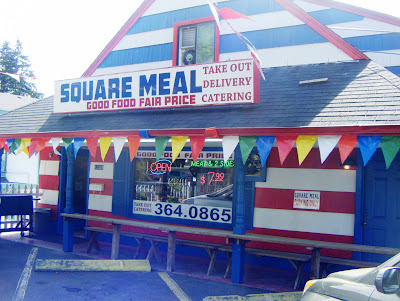 A Square Meal on-the-go. Get yours here — and where? Slave over a hot stove? Fuggetaboutit! Be sure to ask about the housemade desserts, too. Sammy hails from Buenos Aires, and when I called to chat today he couldn’t talk long because he was too busy cooking. But he did take the time to explain that before he got into the Square Meals-biz he was “in the car business.” However, over the course of 30 years, he says, he owned many restaurants — steakhouses, Argentinian grills, and others serving Brazilian, Italian and German food. And who knew? 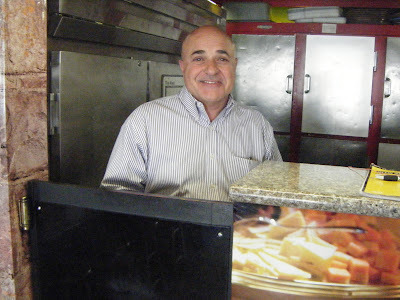 His fellow-cook and business partner (who wasn’t there when I dropped by) is Robert “Roberto” Abergel, the French-Italian character-and-a-half who owned Burrito Express. I probably should have gotten him some meatball marinara with a double portion of baked ziti on the side. 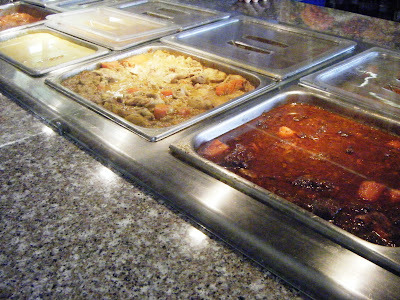 Though if I were buying for myself I’d likely try the beef Bourguignonne with roasted potatoes and ratatouille Nicoise. Or maybe the “Down Home BBQ Pork” with Caribbean black beans and garlic yuca. 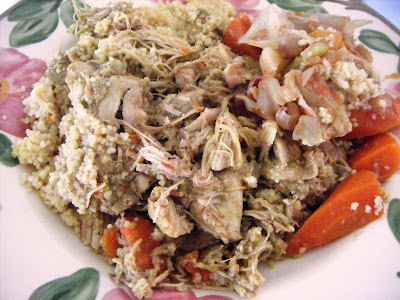 Instead I hooked him up with some coconut curry chicken with couscous and Moroccan vegetables. Once I got the food home, took it out of its clam-shell container and plated up his dinner, I could have lied and said, “Look, I’ve been cooking all day!” But honesty is the best policy. Or is it? When the kid took a look at his Square Meal and said, “Mom! Don’t you know I hate couscous?” I reminded him that being a spoiled brat is about as appealing to me as couscous is to him. By the way, he liked the chicken, which reminded me of an Asian version of my favorite school-cafeteria staple: Chicken a la King (Solomon?). And I was duly impressed that the carrots hadn’t been cooked all to hell and back again. “Very soon we’ll have live barbecue,” Sammy told me today, and for that I’d certainly pay a repeat visit. Especially since their rotating menu is set to include grilled tiras de asado (Argentinian-style short-ribs), pollo limon (“chicken oreganato”) as well as Italian sausage, shish kebab and salmon. How soon? I asked. “We hope in one week.” You’ll find Sammy and company at 12339 15th Avenue N.E., 206-364-0865 where they’re open for lunch and dinner Mondays-Saturdays from 11 a.m.-9 p.m. and Sundays noon to 7. 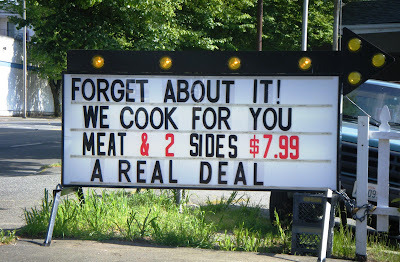 So, where to you go for ready-to-eat “home cooked” meals? And what do you buy when you get there?